BALD Engineering - Born in Finland, Born to ALD: ALD research and development continuous growth! There are a number of ways how to track R&D in a technological field besides tracking the number of publications. 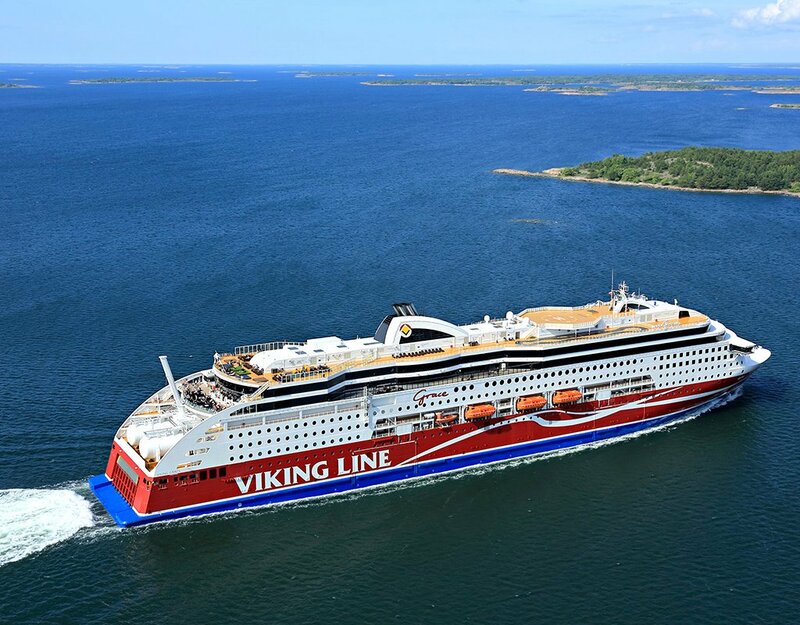 In the case of ALD you can track the number of delegates visiting the annual International ALD conference. ALD 2016 Ireland had 810 delegates and AVS ALD 2017 in Denver had 950 delegates as far as I know. Since the International ALD conference today has >50% industry delegates this is an indication of a growth in R&D interest from both academics and industry. 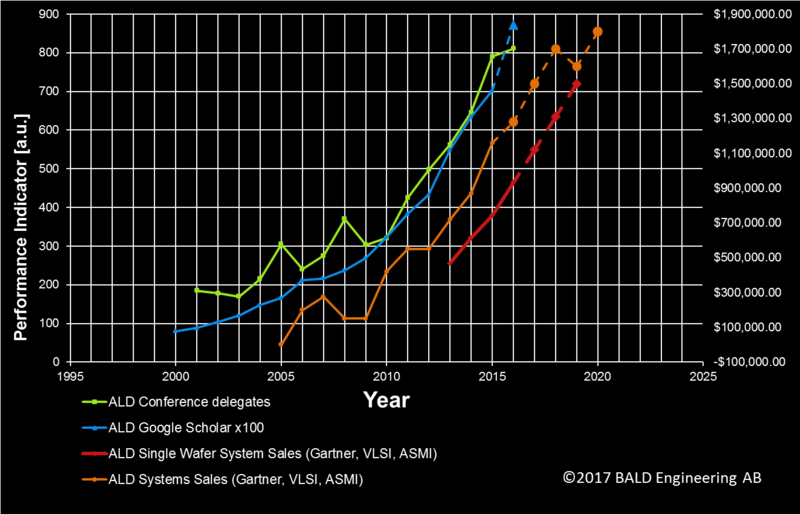 Most of the ALD OEMs have published annual reports now and it seem that 2017 was a stellar year for ALD systems sales. Another way to track ALD R&D is to look at patent filing. Either you can come up with a set of key words that you think will appear in ALD patents or you can dig into the patent classes and make it a bit easier for you since to look for trends you don´t necessary need all patents it may just be enough to look for a couple of classes where ALD people are filing. Since it can take quite some time for patents applications to form actual global families it is more intriguing to track the number of applications. So ta da! 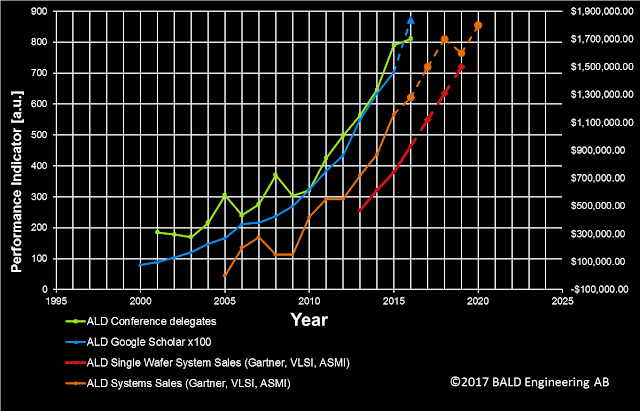 it follows the ALD conference delegate number quite good (green curve above). 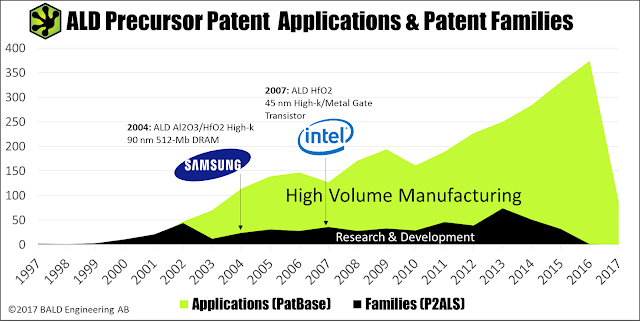 So how was 2017 and how many ALD patents are being filed so far 2018 - check it out below and for those of you that have hard time to sleep you can compile this plot on a daily basis by clicking in this LINK. 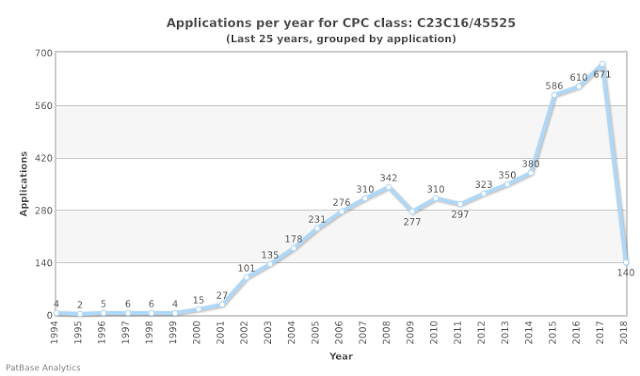 Please note that this graph only contains patent from the CPC class C23C16/45525 and that there are other classes as well that need to be included for a full study. Anyhow it is a good one since it states explicitly Atomic Layer Deposition as coating method. So keep track on the last data point that today is 140 and if it will reach above 671 by the end of the year or not and before that - how many delegates did go to AVS ALD 2018 in Incheon Korea in July!